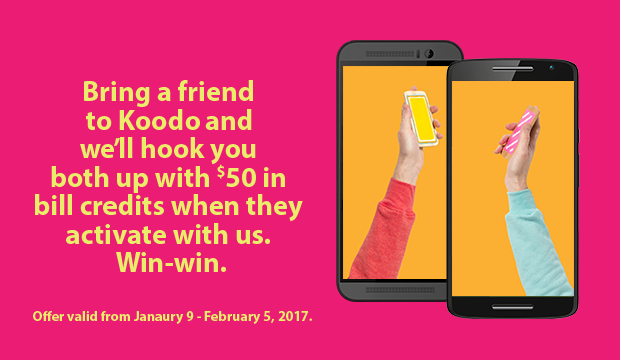 Koodo Mobile has brought back their double Refer-a-Friend bonus, starting today until February 5, 2017. What this means is if you refer friends or family to Koodo, you’ll each receive a $50 credit, instead of the usual $25. The max number of credits caps at $300. Koodo Mobile’s refer-a-friend website also looks to have been updated, now powered by RewardStream to manage the system. The double credit promo seems to appear a few times per year, and the last time we saw it was last May. So if you were about to sign up with Koodo, see if you can find a friend first to nab $50 in credits.